Season the lamb with salt and pepper and brown in a dash of oil in a hot frying pan. Transfer to a slow cooker. Stir together the curry paste, beef stock, coconut milk and pour over the lamb. Scatter in the kumara or pumpkin, and cover. Cook on low for 6-7 hours or high for 3-5 hours. Stir in the spinach leaves, cover and cook a further few minutes until the spinach has wilted. Serve with steamed rice. 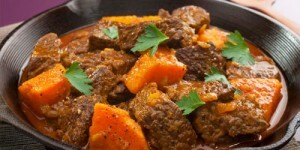 Prepare the casserole as above, adding an extra 1 cup of beef stock. Cook in a lidded ovenproof dish at 160ºC for 90 minutes. A casserole will keep for up to 2-3 days in the refrigerator. Casseroles should be refrigerated immediately after the steam from cooking has evaporated. Place the hot casserole into a shallow container in the fridge so it cools quickly. Do not leave it to cool completely on the bench. To serve bring it slowly to the boil over a medium heat, reduce heat and simmer for about 3 minutes, or until the meat and sauce are both thoroughly hot. Best lamb cuts for casseroling or braising: Diced lamb forequarter, forequarter chops, shanks, frenched shanks, neck chops, lamb topside, leg (bone-in), shoulder (bone-in), easy carve (leg or shoulder bone out), boned and rolled shoulder or leg.